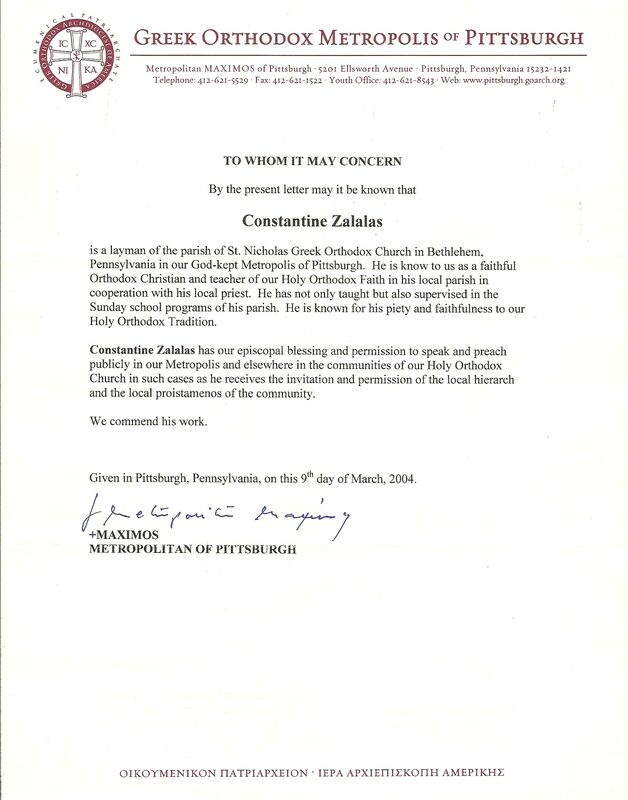 By the present letter may it be known that Constantine Zalalas is a layman of the parish of St. Nicholas Greek Orthodox Church in Bethlehem, Pennsylvania in our God-kept Metropolis of Pittsburgh. He is known to us as a faithful Orthodox Christian and teacher of our Holy Orthodox Faith in his local parish in cooperation with his local priest. He has not only taught, but also supervised in the Sunday school programs of his parish. He is known for his piety and faithfulness to our Holy Orthodox Tradition. Constantine Zalalas has our episcopal blessing and permission to speak and preach publicly in our Metropolis and elsewhere in the communities of our Holy Orthodox Church in such cases as he receives the invitation and permission of the local hierarch and the local proistamenos of the community. Given in Pittsburgh, Pennsylvania, on this 9th day of March, 2004.